Oh, and this little gem almost flew by me because it wasn't in the Warhammer 40,000 section of the Warhammer Community website. 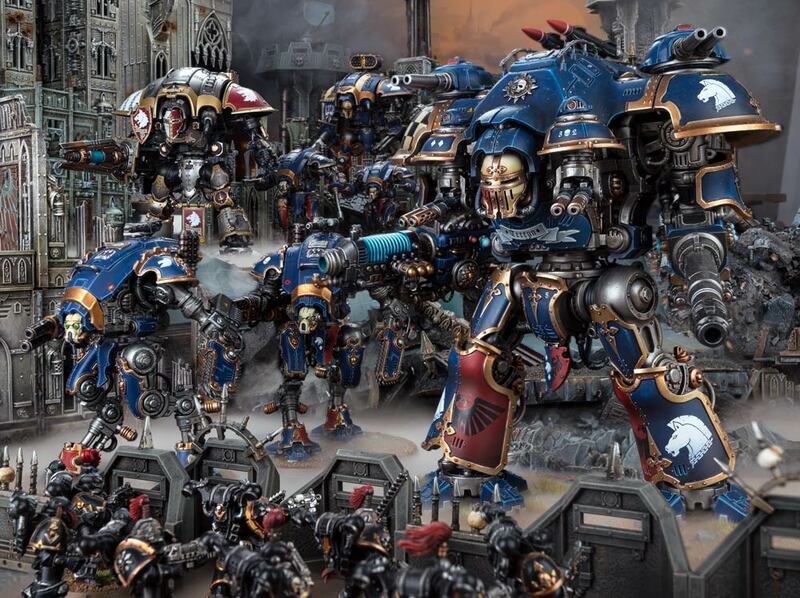 For some reason, they posted an Imperial Knights article that didn't show up on the Warhammer 40,000 section! Whatever. Anyway, today's article is on Stratagems! So what stratagems do we have? Okay...this looks pretty cool. 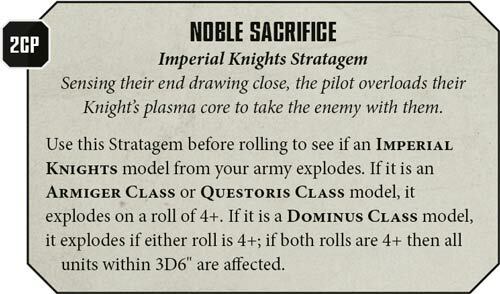 Obviously this works better against low strength models that have Strength 5, 6 or 7, but still have multiple wounds. You do not want to use it against Monsters with Strength 8 or 9, because...obviously you'll not be able to do much. 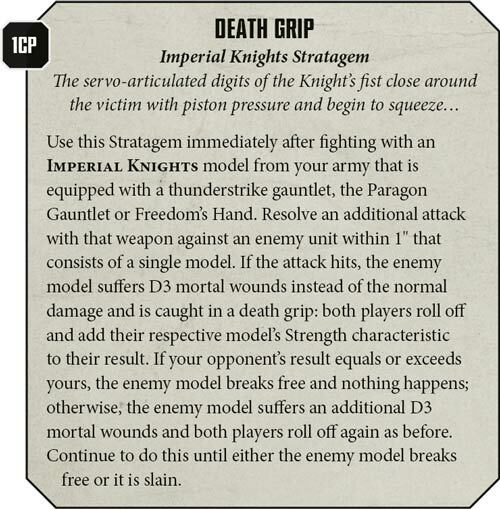 But 1 CP for D3 mortal wounds, and the potential to do additional D3 mortal wounds until it dies is pretty cool, especially against Primarchs like Guilliman or Characters that you really need to kill. 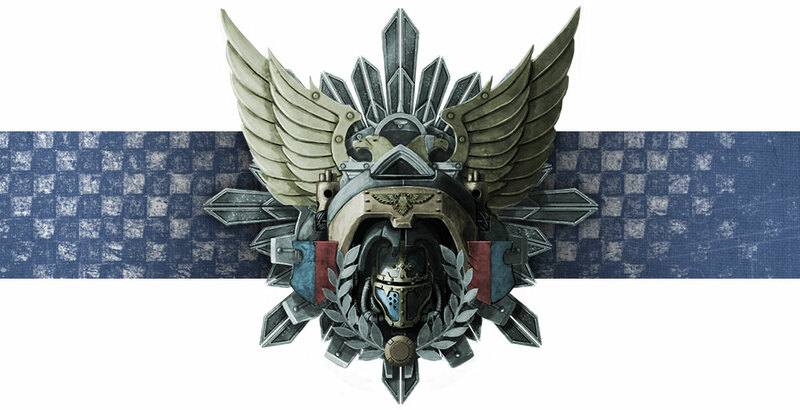 Like Adeptus Custodes. Heh. 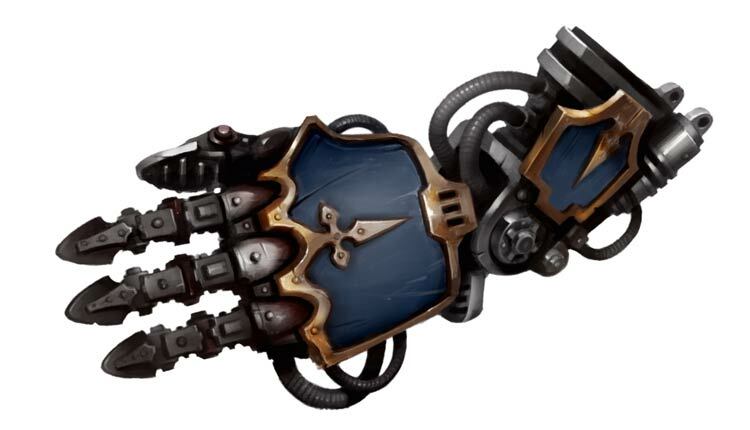 Well, none of my Knights have a Thunderstrike Gauntlet, so this is pretty moot for me. Ah, this is amazing. 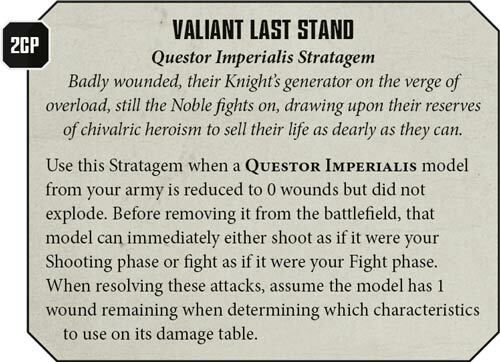 We've already covered this in last week's preview of the Dominus-class Knights, but this basically turns your Knight Castellan (it'll be a waste to use it on your Knight Valiant because it has to stand still, and that's not something you want to do with its short range weapons) into a void shield generator. 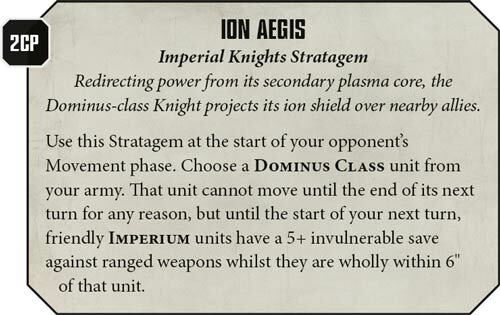 I might try parking my Leman Russ tanks 6" around my Knight Castellan and then activating Ion Aegis over and over again, heh. Oh, this is pretty cool. Of course, I'm pretty concerned about the price - 2 Command Points is a hefty amount to pay, especially when you already have so few Command Points with a pure Knights army (probably will have to add a Kamikaze Storm Troopers retinue for my Knights of House Yato), but if you do have the points, it's definitely worth blowing up your Knight and nuking all the enemy models around him. Heh. Just make sure you don't have any tanks or friendly units within the explosion radius or you'll nuke a big chunk of your army too! What the heck is this?! Well, it's pretty cool, but again, 2 points is a hefty price to pay, and you'll be hitting at 5+ because you only have 1 wound. Ouch. Is it worth it? Well...I guess if you're going to gamble on Titanic Feet or 2D6 shot weapons (or 12/14 Avenger Gatling cannons) or auto-hit weapons (Conflagration cannon and heavy flamer), then yeah. Hell, just lookk at the damned name. It's meant for the Knight Valiant, especially. Heh. 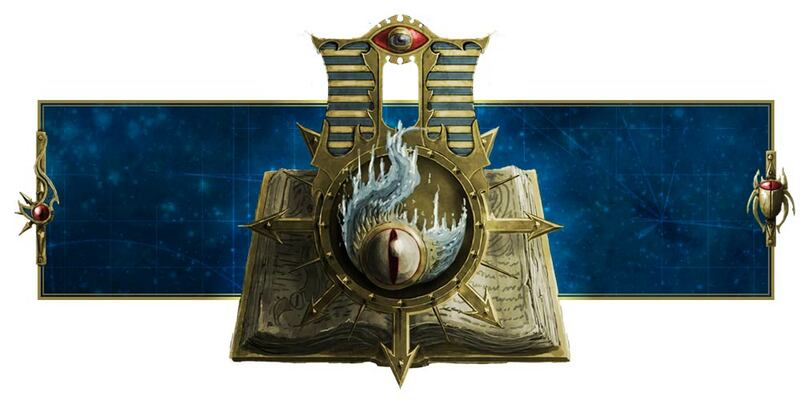 Even Warhammer Community made that same joke. Holy Terra...what the...?! 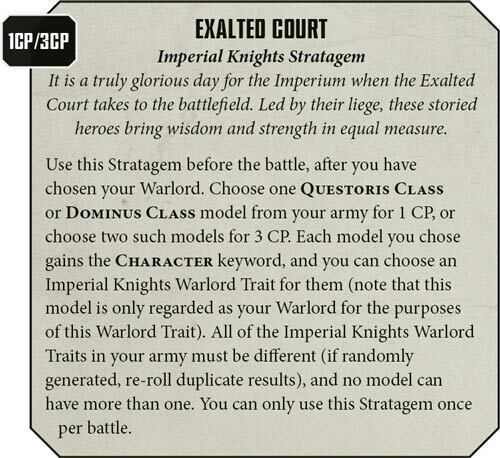 This allows you to take multiple Characters (potentially all 3 Questoris and/or Dominus Knights in your super-heavy detachment) and give them Warlord Traits! Yeah, the Warlord Traits are certainly super-effective (I can see you using the Cunning Commander to refund the 1 Command Point used on this Stratagem), but it also means you can take extra relics or Heirlooms on different Knights! 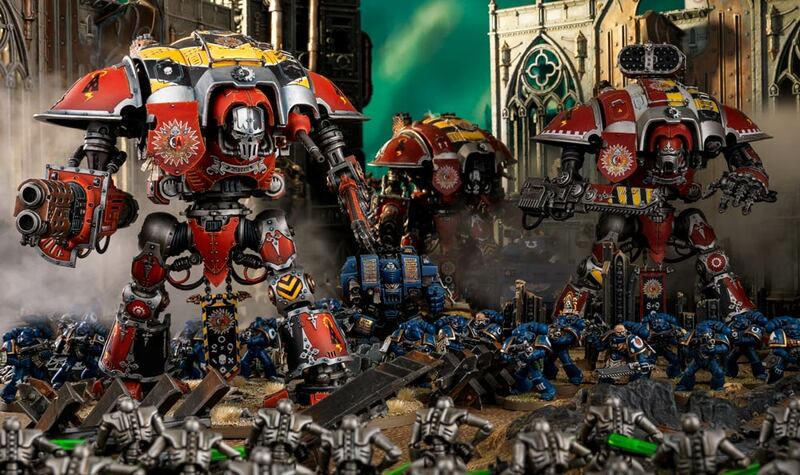 All right, I'll let you know when I see more Imperial Knights news!